The last time I posted about my garden, all of you were all doom and gloom and WOE BETIDE YOU, NAÏVE GARDENER about my zucchini plants. And you were absolutely right. They are very productive. But not one of you said anything about the green beans, and I'm not sure I'll ever be able to trust you again. Because, okay. I went out there one day a week and a half ago and saw a baby bean on my green bean plants. Exciting! I grabbed the camera to take a picture (shut UP, it was my own very first baby bean that I grew all myself from a SEED), and I did, and then I looked slightly up and it was like one of those horror movie moments, where the camera pans back and you realize OH MY GOD THEY'RE EVERYWHERE IT'S TOO LATE TO RUN. They were, in fact, everywhere. Not baby beans, but full-grown beans. My green bean plants, grown by me from seeds selected by the earthling, have turned into a green bean factory. They produce a pound or two of green beans every two to three days, and if I should miss three days in a row of picking, they get very, very ugly. Even with diligent (or as diligent as possible; I screwed up the spacing there, too, so it's very hard to get anywhere near the green beans now, especially with the Lurking Squashy Threat I'll get into later) picking, I miss them, and come back to find a giant bean lurking somewhere. And, true fact: I can search through all the plants, pick all the beans I can find, and come back half an hour later and get another handful of beans. Either they're wily or they're scary productive. I'm guessing both. I'm almost afraid to tell you about the other garden development, because - look. I did not know any better, okay? I am innocent in this. The earthling wanted a pumpkin kit. I got one. I planted ONE pumpkin plant. And there were all these warnings on the kit about how it was not a toy and not to be used unsupervised, but there was no warning anywhere about the seed's unfulfilled dreams of starring in a SciFi original movie called The Electric Pumpkin Apocalypse. Unfortunately, that movie is now taking place in our backyard. I am expecting Misha Collins and David Hewlett to show up in suspiciously clean lab coats at any moment, because - okay. 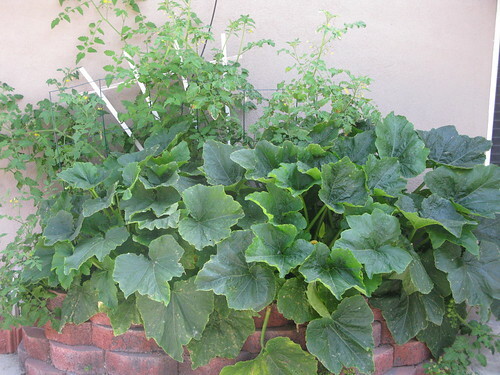 About two weeks ago, Best Beloved and I were surveying the pumpkin plant - only a little fearfully, because we did not know then what we know now - and noticed that it had overrun the little brick borders of the garden plot and started to creep across the part that's still lawn. "Think it'll make the walkway by the end of the summer?" I asked Best Beloved. "Maybe," she said, surveying the six feet or so it still had to cover. "Maybe." It's on the walkway now. In the other direction, it is almost over the fence to the neighbor's yard, and god only knows what they have over there that it could eat to grow stronger. Worse, okay, I planted this garden in the place that used to have a fishpond, right? Well, the previous owners had a sort of waterfall thing in the pond. For which they had to run electricity out to the back wall. The pumpkin plant is now intimately entwined with the electric outlet and the wiring. Very. Intimately. There are little green tendrils prying into the covered box. Really, the zucchini-tomato mass, while still terrifying, is starting to look tame in comparison. Because, okay, yes, it is covered in baby green tomatoes, and I am frantically harvesting zucchini as soon as I find them, often sustaining moderate injuries to do so (screw shark armor; they need to make squash armor), but at least those plants are in a raised bed. They are contained. The pumpkin (and the green beans, for that matter) can go anywhere. There are suspicious noises from the backyard at night, now. Thumps and slithers. I - I am very scared. This may be how the world ends, people. The earthling contemplates the pumpkin plant. 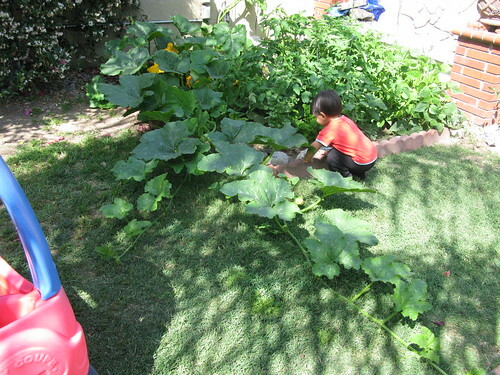 Compare the size of the two-year-old to the size of the pumpkin leaves. Also note that this is after Best Beloved, at no small hazard to her person, hacked off half the plant. The future site of the zucchini-tomato mass, on 4/10. Yes, I am well aware that I bungled the spacing, here. I am learning. Also, so far, living. The zucchini-tomato mass, two months after planting. You see that little happy tag indicating what the plants are, in the picture above? Yeah, it's gone. The zucchini ate it. Which is a pity, because now I'd really like to know. Also note the trellises, helplessly adrift on the mass of greenery. Have you considered that you may have accidentally purchased a pumpkin coach kit? I would like to believe that. I really would, because my current theory is along the lines of VAMPIRE PUMPKINS or maybe they aren't really pumpkins and this the first step of the alien takeover or, you know, things of that ilk. I have no idea! By next week we could be deeply traumatized by our VERY FIRST DAY OF MOVING ON OH NOES. But maybe! Are you going? "I am expecting Misha Collins and David Hewlett to show up in suspiciously clean lab coats at any moment"
I didn't see it, but malnpudl provided me with a summary that made me laugh helplessly, and also kind of shorted out my brain a little. Ah, brings back so many memories! My husband and I sharecropped with another couple when we went back to school. We had two deep-bed gardens--one was 8x12' and the other was 4x12'. We grew tomatoes, zucchinis, sweet corn, green beans, broccoli and watermelons. We fed 12 families with the produce from those two beds, not the least of which were the green beans (think Triffids) and the watermelons. 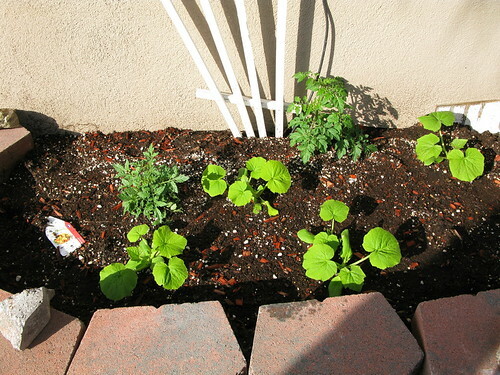 We planted four watermelon vines, considering how much we all loved them, right? Those four vines took up the entire half-acre backyard and tried to tear the back fence down to get into our neighbors' yards. We stopped counting at 400 melons. I spent the summer learning how to can everything, how to make six different types of pickles, zucchini salad, zucchini chips, zucchini bread. Yes, it was an exciting time! We had a volunteer that came up like a zombie out of the (dormant) compost heap in the late spring. It turned out to be a cantaloupe vine. AWESOME! Our only failure was broccoli, and I remember looking at my friend Terry and mouthing "Thank God" when they didn't all produce. Oh god. I planted two watermelons, but I planted them a little late, so I was thinking I wouldn't get any actual melons. You mean there's the possibility of MORE horror? Also, canning. Hmmm. Maybe I should learn how to do that. Knowing the rose-by-any-other-name channel, they'll cast us with two hot guys. But explosions seem like a guarantee, unless it's too expensive. And, seriously, why is there not gardening armor? I WOULD BUY SOME. You are your own cheap horror movie! It's awesome! Have you roasted the green beans? Oh my god no! It never occurred to me to roast them, even though my general vegetable default is to roast. Any suggestions for recipes? Ah, so much garden envy :( We need glasshouses down here to get that sort of growth! I would not want to have to have a glasshouse, but at least with those, you have a chance to contain your squash. Okay, VERY IMPORTANT QUESTION: have you fed the plants blood? If Yes: do you hear a baritone calling you 'Seymour'? I was about to say no, no blood, and then I realized maybe I HAVE. Because the thing is, squash have these long pointy thorny bits, and there's no way to prune them or harvest them without bleeding a little. ...I am even more scared now. Sell the house, move to Canada, change your names. Hopefully by the time the pumpkins, beans and zucchini get to the border, a cold snap will have set in and you and most of the Canadians will survive. We won't, of course, and I hope you'll feel guilty. But really, it's too late for blame or non-violence, just run. Now. I don't think Canada grants asylum to fleeing gardeners. But it SHOULD. A local pub put some pumpkin seeds through my door. I daren't even open the packet. I would advise you to burn the packet, and also maybe the pub. Hi! You seem interesting & we have several LJ friends in common. Mind if I friend you? Thank you! I am delighted to be friended. Hi! Why don't the seed packets come with WARNINGS? It's amazing how completely you can end up buried in beans. Heh heh he. OK, I'm only laughing because although I don't have a garden in my condo....I've had them in the past. And seriously, they can quite take over. I know this is a strange thing to say, but I'm of the belief that there's no such thing as too much zucchini. Or tomatoes. But the electric kool-aid-pumpkin-machine sounds scary to say the least. So far, we haven't had too many zucchini. And it's hard for me to imagine too many tomatoes - this family basically runs on tomatoes. So I tentatively agree with you. And there can be no question about the scariness of the pumpkin, of course. Ah well, at least if you go very quiet we'll have a good idea of what ate you happened. It was always on our kitchen bookshelf and I never understood how you could have too many tomatoes...until I did, and wept with the knowledge. I am seriously tempted to buy that book, I tell you what. Also, I am assuming we will not have Too Many Tomato problems this year, because we are very enthusiastic tomato-eaters, but I did plant eleven plants because I thought most of them would die. None of them has died yet. One of my coworkers told me that zucchini can ripen by moonlight. Make of that what you will. Also, I am consumed with garden envy! All my vegetables are grown in pots, and my carrots... well. I think the whole crop put together came to about an eighth of a standard carrot? If I'm generous? Alas! Current experiment: cauliflower. So far it doesn't seem to be doing anything, but I think it's sulking because I put it in with the chilli plant (actually a success!). In my defence, I was told that the chilli plant would die off in winter, which... well. The chilli plant apparently missed that memo, and I don't feel inclined to pass it on since I like my chillis. So the cauliflower did not wind up being the sole inhabitant, and I think it is sulking. Ooo, pots! Do you use self-watering containers? I have been hearing, or rather reading, good things about them. And I have not made any attempt to grow cauliflower. Carrots I do plan to grow, but they will have to wait a bit, as it's really too hot and sunny for them here during the summer. Also, my chili plant is languishing. If only you lived on the same continent as we do, we could crop share.